Download "ASSOCIATE DEGREE (ADN) programs in Virginia"
1 INSPIRATION FOR ASPIRATIONS: VIRGINIA NURSE INSIGHTS ABOUT BSN PROGRESSION AMY B. GILLESPIE, EDD, MSN, RN AND NANCY LANGSTON, PHD, MN, RN, FAAN, ANEF The Partnerships for Progression: Inspiration for Aspirations project was developed to create a culture of academic progression for nurses in Virginia. A survey was completed by 128 nurses who are currently enrolled in Registered Nurse to Bachelor of Science in Nursing programs throughout Virginia to learn why registered nurses pursue the bachelor of science degree (BSN) and to identify supports and obstacles that influence their experiences. Findings indicate that BSN progression is influenced by an interacting set of personal, work, and educational factors. Family support was cited as the most important facilitator for returning to school, yet time demands of balancing family, work, and school were seen as major obstacles to continuation. Internal motivation may differentiate nurses who return to school from those who do not. Determining ways to inspire nurses while implementing practical steps for enabling nurses to pursue a BSN and succeed once they enroll is the challenge for nursing service and educational organizations. (Index words: Nursing education; Institute of Medicine; RN-to-BSN student; Baccalaureate completion education) J Prof Nurs 30: , Elsevier Inc. All rights reserved. ASSOCIATE DEGREE (ADN) programs in Virginia meet vital health care workforce needs and are a strong source of diversity for the nursing workforce. ADN and diploma programs graduated 66% of new nurses in Virginia in 2011, and approximately, 36% of those new graduates self-reported as non-white or Hispanic (Healthcare Workforce Data Center, 2012). ADN programs provide access to nursing education for students in underserved rural and urban areas. Important opportunities for first generation college students and second career adults to enter the field of nursing are being provided by community colleges in Virginia. Creating a culture of progression that can pull associate and diploma-prepared nurses into continuing their academic progression is the challenge addressed by the Inspiration for Aspirations project. Recommendations from Institute of Medicine (IOM; 2010) have been taken seriously by nursing organizations in Virginia. Virginia was in the second wave of states to Virginia Commonwealth University School of Nursing, 1100 East Leigh Street, Richmond, VA. Address correspondence to Dr. Gillespie: Virginia Commonwealth University School of Nursing, 1100 East Leigh Street, Richmond, VA (A.B. Gillespie), (N. Langston) become an action coalition state. The Education Committee of the Virginia Action Coalition has accepted as one of its goals the IOM recommendation of having 80% of the nurse workforce prepared at the bachelor's level or beyond by However, nurses in Virginia prepared at the ADN or diploma level return to school for a bachelor of science degree (BSN) at a rate of only approximately 30% within 10 years of graduation from their prelicensure program (Virginia Department of Health Professions, 2010). Virginia's BSN programs are graduating approximately 1,300 new nurses annually, but nurses who complete a prelicensure program at the associates or diploma level will need to return to school at record numbers for Virginia to even approach the 80% BSN goal. Hence, a project that arose from the 80% goal was to create a climate and develop practices that inspire students enrolled in associate and diploma programs to progress in their education. Funding to support development of the project Partnerships for Progression: Inspiration for Aspirations was provided through the Northwest Health Foundation National Partners Investing in Nursing's Future grant, with matching funds provided by the Richmond Memorial Health Foundation and the Medical College of Virginia Foundation. 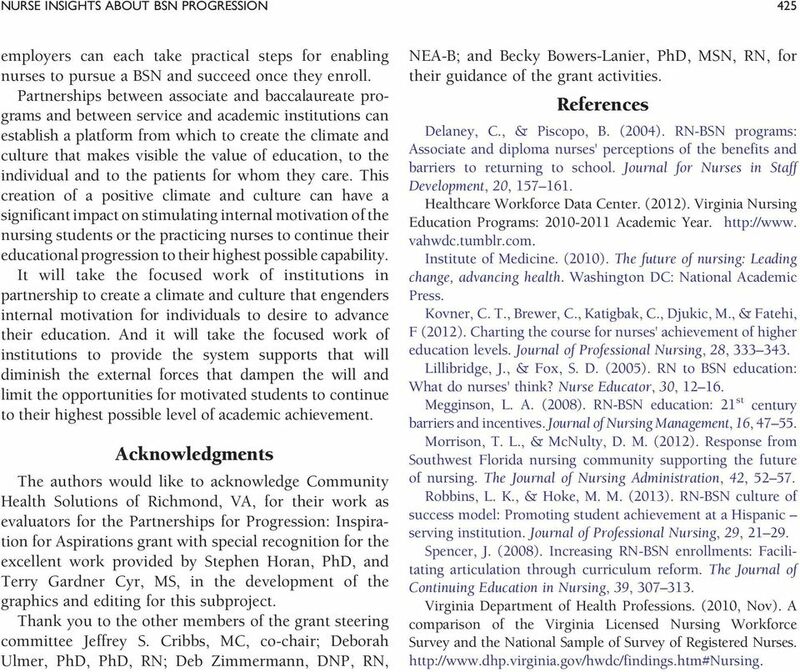 The project's mission was to enhance partnerships between and among educational institutions and facilitate a culture that will encourage Journal of Professional Nursing, Vol 30, No. 5 (September/October), 2014: pp Elsevier Inc. All rights reserved. 3 420 GILLESPIE AND LANGSTON Yes, Part Time 11% beyond the BSN. Open-ended comments included I went back to obtain my BSN because I want to apply for the NP program next fall and I personally wanted to obtain my BSN because I have been in nursing for many years, and I had the opportunity to do this program, and hope to pursue graduate degree. This finding differs from results obtained in the southwest Florida study and may be an indication that nurses who go back to school have different long-term career goals than nurses in the general population. The second most highly rated factor (mean rating of 3.98) was the ability to pursue a clinical position requiring a BSN. Because the majority of the nurses who responded to the survey are employed by hospitals (77%; Figure 2), this finding may be indicative of the policy changes made by institutions seeking to achieve an 80% BSN nursing workforce as recommended by the IOM (2010). The job market is so competitive and you must have a BSN or graduate degree in order to achieve the job that you are seeking or applying for. It is becoming more and more necessary to have a BSN as more hospitals upgrade requirements for bedside nurses. I graduated from an associate's program in late 2009 and was unable to find employment due to my lack of experience. I had intended to go back to school to earn a Bachelor's and at the time this was my only option. I am glad I returned to school and hope this will give me a competitive edge over other Public Health 2% Other 12% Long Term Care 5% Clinic or Office 8% Employment No 12% Yes, Full Time 77% Figure 1. Are you currently employed as a nurse? Setting of Current Employment Hospital 73% Figure 2. In what setting is your most current or recent job as a nurse? applicants. The third most highly rated factor was the opportunity for higher pay. Personal love of learning received a mean rating of 3.8 and ranked fourth (of the seven factors) lower than the more tangible outcomes of career opportunities and pay. The RN-BSN students were strongly influenced by the more internal motivator of a desire to learn. opportunity to enhance the things I had learned during my Associate program and expand on those things. I had a thirst for learning prior to starting the program, but that has been magnified since starting. Personal accomplishment of a long time goal. continuing education to provide the best care and to be an example to my daughter. 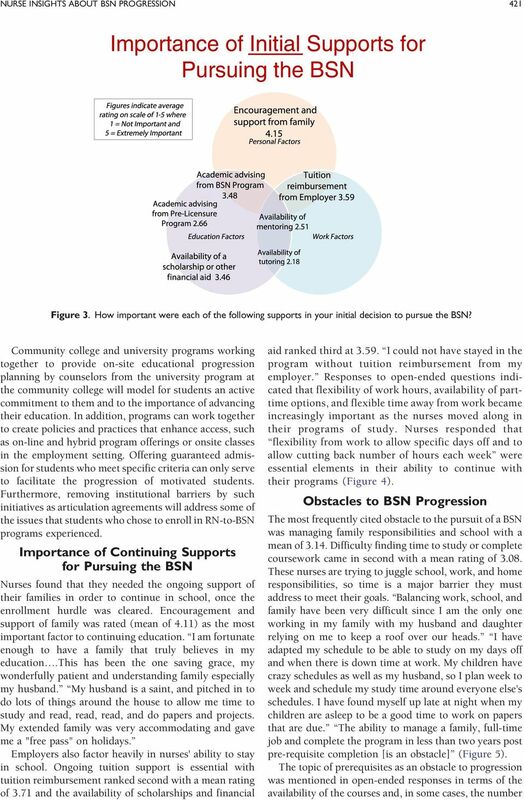 Importance of Initial Supports for Pursuing the BSN Encouragement and support from family was cited as the most important factor in the initial decision to pursue a BSN with a mean rating of Balancing the commitments of family, work, and school were frequently cited as stressors in past studies (Morrison & McNulty, 2012), so having the support of family prior to making the decision to enroll was key for the nurses. The average age of RN- BSN student respondents in this survey was 38 years, and 95% of them were women. It is likely that many respondents are currently raising children and need to factor those responsibilities into any decision. Family support is mandatory. If there is no support the whole project fails. Employment factors such as tuition reimbursement (mean rating 3.59) and the availability of scholarships (mean rating 3.46) address the financial concerns that constrain many nurses from pursuing additional education. Knowing that the monies were available provided an added support that encouraged these nurses to enroll in school (Figure 3). Academic advising from the BSN programs was also ranked highly as a factor that facilitates the initial decision to return to school with a mean rating of The array of prerequisites and admission requirements for BSN programs can be confusing hence the importance of academic advising at the time the nurse is considering returning to further education. The median length of time between completion of their prelicensure program and enrollment in a BSN program for survey respondents was 8 years, with a range of 0 35 years (Spencer, 2008). The ready availability and openness of advising from the BSN program became important because the nurses became more removed from their original educational setting. Respondents reported that local community colleges helped them with the transition with advising and support to complete prerequisite and general education courses. My academic advising from was wonderful, helpful and essential. These findings and comments indicate the importance of the community college/ university relationships and agreements in supporting these nurses with their educational goals. 5 422 GILLESPIE AND LANGSTON Importance of Continuing Supports for Pursuing the BSN Figure 4. How important were each of the following supports in allowing you to continue attending school for the BSN? required. I am finding that this balance is very difficult as the bridge program requirements are very extensive when managing career and family simultaneously. Many RN- BSN programs have adapted their course schedules to meet the needs of working, adult students, but limited options still serve as a barrier for some nurses in some academic settings. In addition, even when nursing programs have adopted an on-line format for the nursing courses, frequently, the general education and nursing prerequisite courses required for the program are not online and, hence, continue to create a barrier to access. Schedule of courses [is an obstacle]. I have to wait a full year before I can graduate. I only have three classes left to take to graduate and I must take one each semester for three semesters in order to graduate. Limited availability from one semester to the next for needed classes. [BSN program] did not offer other needed classes online, or evening or weekend had to go outside of campus to get non nursing classes to fit my schedule (Figure 5). Summary Observations Although the findings from this survey indicate that the actual obstacles experienced by nurses enrolled in BSN completion programs are similar to the anticipated barriers cited by nurses who have not yet chosen to continue their education, there are some differences between these populations of nurses. 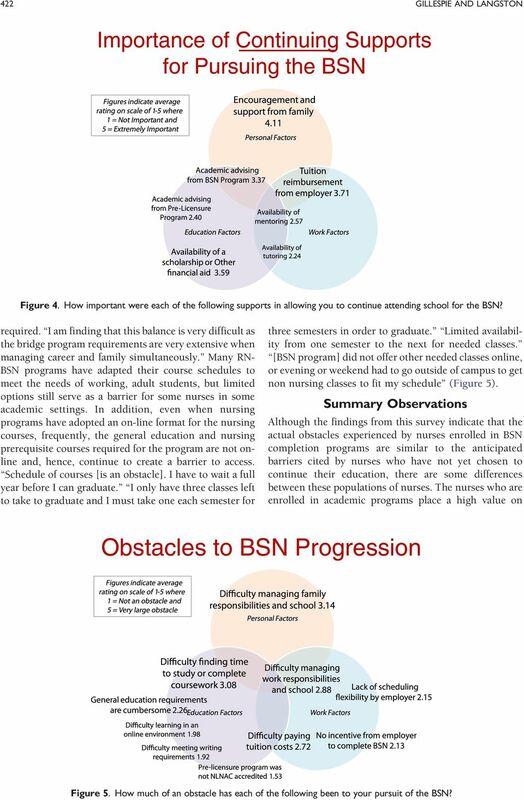 The nurses who are enrolled in academic programs place a high value on Obstacles to BSN Progression Figure 5. How much of an obstacle has each of the following been to your pursuit of the BSN? 7 424 GILLESPIE AND LANGSTON Commonwealth is difficult if not impossible. The argument could also be made that a lockstep approach to educating nurses would eliminate valuable diversity in perspectives that nurses from different educational world views bring to the workplace. In addition, community colleges in Virginia do not all have the same general education requirements, so matching the courses completed with the courses required for a nurse with an ADN seeking to complete a BSN can be laborious and confusing. Facilitating opportunities for community colleges and universities to work together on partnerships that promote seamless progression, including an ongoing examination of general education courses is a key to overcoming this potential obstacle. For nurses in this study, workplace incentives have a role in the motivational piece of educational progression. While nurses cited the requirement of a BSN or higher for their current or desired roles as a push for returning, they also stated that a lack of incentives such as increased pay or changed/enhanced responsibilities after obtaining the BSN was discouraging. The cost of on-line BSN programs is extremely high and there is no financial incentive to obtain my BSN. This finding aligns with reasons given by nurses in other studies for not returning to school (Morrison & McNulty, 2012). Differentiation in nursing roles within the clinical setting and clear financial incentives for advanced education may help encourage nurses who are on the fence about enrolling. Inspiration Policies and procedures in the workplace or academia will not be able to directly address the one factor that seems from this study to help differentiate nurses who return to school from those who do not. Placing a strong personal value on learning cannot be mandated. The mean score for having an opportunity to pursue a graduate degree was higher than that of greater pay or the opportunity for clinical advancement (Figure 7). Creating a culture that encourages academic progression requires an acknowledgement that education is not the same as just getting a degree. Tangible incentives from employers such as higher pay or opportunities for advancement combined with builtin support systems such as strong academic advising, mentoring, and cohort education can provide an atmosphere where lifelong learning becomes the norm. Encouragement and participation of other coworkers in same classes was a strong support mechanism. Hospital cohort was extremely important. My academic advising from was wonderful, helpful and essential. Information is not the same as inspiration. Nurses who express concern about being too old to return to school can benefit from mentoring with older nurses who were successful at completing an advanced degree. It was a lifelong goal and I have been able to finish now that kids are grown. Nurses who question the value of more education should hear stories from nurses who find that they do deliver better care as a result of new knowledge and insights. Returning to school is stressful and difficult. Without internal motivation or inspiration, many nurses will not be able to overcome the very real obstacles they face. Summary Nurses currently enrolled in BSN progression programs are an important source of insight for facilitating advanced education for nurses. BSN progression is influenced by an interacting set of personal factors, factors in the work environment, and factors in the educational environment. Academic programs and Factors in Personal Motivation to Pursue the BSN Degree Figure 7. How important were each of the following factors in your personal decision to pursue the BSN degree? 8 NURSE INSIGHTS ABOUT BSN PROGRESSION 425 employers can each take practical steps for enabling nurses to pursue a BSN and succeed once they enroll. Partnerships between associate and baccalaureate programs and between service and academic institutions can establish a platform from which to create the climate and culture that makes visible the value of education, to the individual and to the patients for whom they care. This creation of a positive climate and culture can have a significant impact on stimulating internal motivation of the nursing students or the practicing nurses to continue their educational progression to their highest possible capability. It will take the focused work of institutions in partnership to create a climate and culture that engenders internal motivation for individuals to desire to advance their education. And it will take the focused work of institutions to provide the system supports that will diminish the external forces that dampen the will and limit the opportunities for motivated students to continue to their highest possible level of academic achievement. Acknowledgments The authors would like to acknowledge Community Health Solutions of Richmond, VA, for their work as evaluators for the Partnerships for Progression: Inspiration for Aspirations grant with special recognition for the excellent work provided by Stephen Horan, PhD, and Terry Gardner Cyr, MS, in the development of the graphics and editing for this subproject. Thank you to the other members of the grant steering committee Jeffrey S. Cribbs, MC, co-chair; Deborah Ulmer, PhD, PhD, RN; Deb Zimmermann, DNP, RN, NEA-B; and Becky Bowers-Lanier, PhD, MSN, RN, for their guidance of the grant activities. References Delaney, C., & Piscopo, B. (2004). RN-BSN programs: Associate and diploma nurses' perceptions of the benefits and barriers to returning to school. Journal for Nurses in Staff Development, 20, Healthcare Workforce Data Center. (2012). Virginia Nursing Education Programs: Academic Year. vahwdc.tumblr.com. Institute of Medicine. (2010). The future of nursing: Leading change, advancing health. Washington DC: National Academic Press. Kovner, C. T., Brewer, C., Katigbak, C., Djukic, M., & Fatehi, F (2012). Charting the course for nurses' achievement of higher education levels. Journal of Professional Nursing, 28, Lillibridge, J., & Fox, S. D. (2005). RN to BSN education: What do nurses' think? Nurse Educator, 30, Megginson, L. A. (2008). RN-BSN education: 21 st century barriers and incentives. Journal of Nursing Management, 16, Morrison, T. L., & McNulty, D. M. (2012). Response from Southwest Florida nursing community supporting the future of nursing. The Journal of Nursing Administration, 42, Robbins, L. K., & Hoke, M. M. (2013). RN-BSN culture of success model: Promoting student achievement at a Hispanic serving institution. Journal of Professional Nursing, 29, Spencer, J. (2008). Increasing RN-BSN enrollments: Facilitating articulation through curriculum reform. The Journal of Continuing Education in Nursing, 39, Virginia Department of Health Professions. (2010, Nov). A comparison of the Virginia Licensed Nursing Workforce Survey and the National Sample of Survey of Registered Nurses. 1. What are the philosophical underpinnings of the program? St. Petersburg College College of Nursing Advisory Committee Meeting Minutes Date: September 6, 2012 Time: 9:10 a.m.